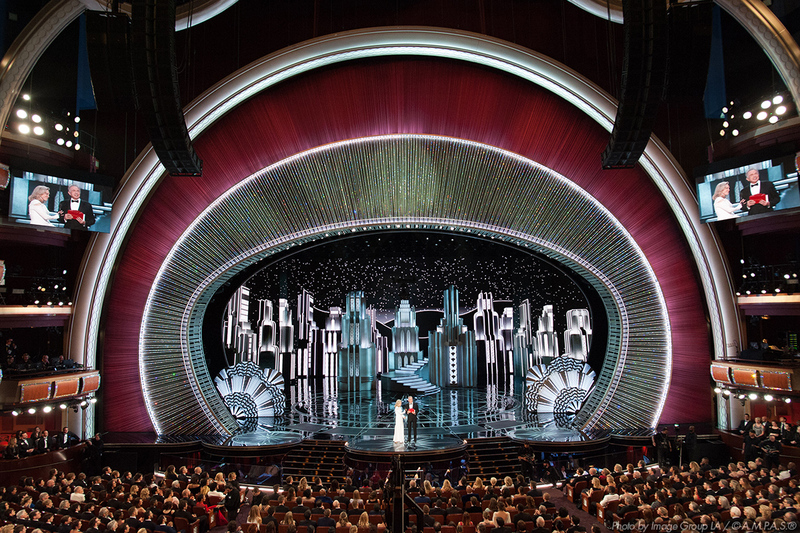 Award-winning designer Derek McLane will design the Oscars 2018 stage for the sixth consecutive year, complete with 45 million iconic Swarovski Crystals. This will be McLane's sixth consecutive stint as Oscars production designer, whose main duties are to turn the giant Dolby Theatre stage into an unforgettable setting for the Oscars. Ceremony producers Michael De Luca and Jennifer Todd announced his appointment on Friday, Feb. 9. McLane was first hired for the 85th Academy Awards in 2013 by then-Oscars producers Craig Zadan and Neil Meron. The Tony Award-winning production designer has added more awards to his name since taking on the Oscars gig. McLane has earned Primetime Emmy Award nominations for every year he's worked on the Oscars telecasts and won in 2014. The 2017 Oscar set design, as seen during the infamous final moments of the ceremony. 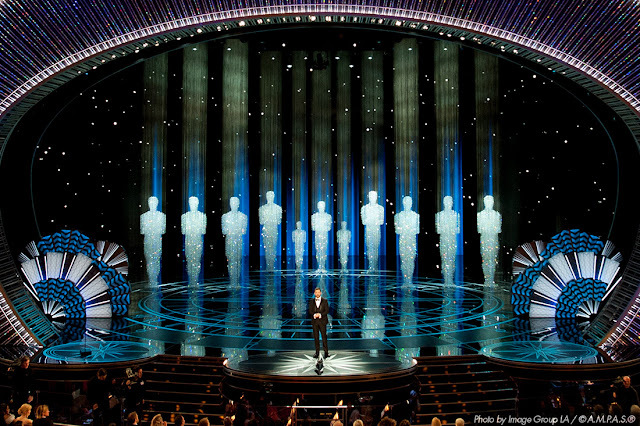 ’s Oscars set design include: a brand-new proscenium; the return of the beloved floating Oscars; and a signature backdrop curtain and opera box covers. The piece will be constructed from octagonal tiles with a mix of crystal, metal, mirror and other materials to achieve its complex and beautiful shape. Featuring more than 140,000 crystals, the beautiful floating Oscars (pictured above) will return for the second year. Other crystal items include an original backdrop curtain with more than 80,000 crystals and an annual staple: the theater's opera boxes will be embellished with more than 23,000 crystals. McLane has given Architectural Digest a sneak peek into his design the last two years. This year should follow suit. Stay tuned to The Gold Knight for full coverage. The Academy first partnered with Swarovski in 2007 thanks to production design J. Michael Riva, providing the crystal curtain for the musical number for “Dreamgirls.” The curtain was a one-ton, 34-foot custom-designed Swarovski crystal curtain sparkling with more 50,000 crystals. 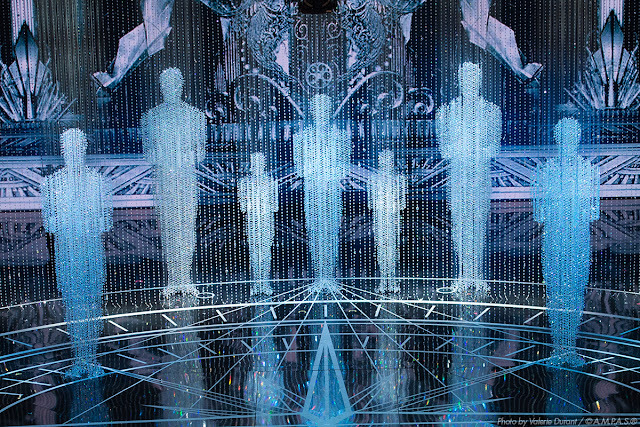 Flash forward a decade later, the partnership has seen more than one million crystals incorporated into the Oscars' set design. Dazzling moments include McLane's 2013 crystal backdrop, which lit up Adele's show-stopping performance of the Oscar-winning song "Skyfall," and the crystal drapes he created in 2014, which sparkled as Idina Menzel performed "Let it Go" from "Frozen." Stay tuned to The Gold Knight for complete coverage of the 90th Academy Awards, including Red Carpet coverage from Hollywood on Oscar Sunday. The 90th Academy Awards, for outstanding film achievements of 2017, will be presented on Sunday, March 4, 2018, at the Dolby Theatre at Hollywood & Highland Center, and will be televised live on ABC and in more than 225 countries worldwide. Jimmy Kimmel hosts. "The Oscars: All Access" live stream from the red carpet and backstage will begin at 6:30 p.m. ET / 3:30 p.m. PT.